I can’t believe that this has been and gone already! Did you see any of it on TV? Here is my Old Man doing his bit as a referee, and loving every minute, even in the rain. Well, he is a true golfer, so a bit of wet weather doesn’t really bother him…his groupie, on the other hand, ( me!) prefers to spend her time in the warmth and splendour of the R&A tent that we are allowed in. Of course, I did follow Him around, dodging through the crowds and trying to be in sight as much as possible without distracting him from his duties. This can be quite a challenge for those of us who are “upwardly challenged”…one drunk chap told me even dwarves are taller than me – oh the intellectual chat around the course! 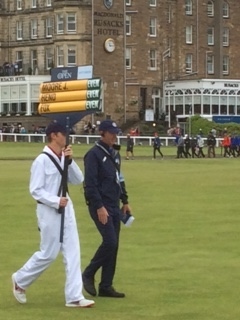 I had, as usual, a fab week being entertained by the R&A, both before the competition started ( visiting Falkland Palace and Balgove Larder for lunch), and during, enjoying meeting up again with other wives from all over the world. We were put up in the halls of residence by the R&A, in Agnes Blackadder Hall for us – she was the first female graduate of St.Andrews. It brought back some strange memories of uni life – tho we never had a double bed ( I’m sure they have got smaller!) nor an en suite! Such luxury…yes, I know, I’m so old! Breakfast in the refectory showed Hubby what he had missed by going to Oxford, both food-wise, and rubbing shoulders with your fellows first thing in the morning… Putting makeup on first thing is more difficult without my lenses in, I must remember that! Each evening we were offered a three course meal with the guests of the R&A in the Old Course Hotel. This is a chance to meet the other referees, wives, and those involved behind the scenes in this amazing event. A couple of nights saw us skip off into St.Andrews for pizza and time together, which was lovely. Lots of walking meant my impression of a pregnant woman started to recede, and wearing waterproofs allowed me to sweat off a few lbs put on the night before…I’m going to admit to at least one 99 ice cream too…well, it had to be done! Sadly we had to miss the final day thanks to a holiday booked in Italy and the awful weather that delayed play. We left St.Andrews at 4am to fly back to Gatwick, swap suitcases and clothes, and then fly off to Pizza to help Hubby relax on the second week of his summer holidays. The final was very exciting as we caught up on our iPads, and we will have to plan next year’s holiday very carefully as the 2016 Open is at Troon in Scotland again…fingers crossed for a sunnier one.